Yesterday was national day in China. It’s a day to celebrate the formation of the People’s Republic of China back in 1949, and the people were definitely out in force. Beijing was packed full of people making their way to Tiananmen Square for the festivities that evening. We had to leave Beijing before the final celebrations, but the day was stressful enough. Most roads were closed making it almost impossible to make your way to the square, and once we eventually did get there, there was nothing to see, and we swiftly left. We made our way to Starbucks for a Frappuccino to cool us down from the baking heat. Our time in Beijing was enjoyable, but I think we were both ready to leave. Spending a week there was very tiring. That could have been to do with the amount of Tsingtao that we drank during the week, or the amount of dumplings that we ate each day. The dumplings have actually been our best find so far, and we’ve tried every variety that we could find. Beijing wasn’t without incident. On returning from one of my daily trips to get breakfast, I was greeted by a concerned Katy saying “I’ve had a nightmare”. 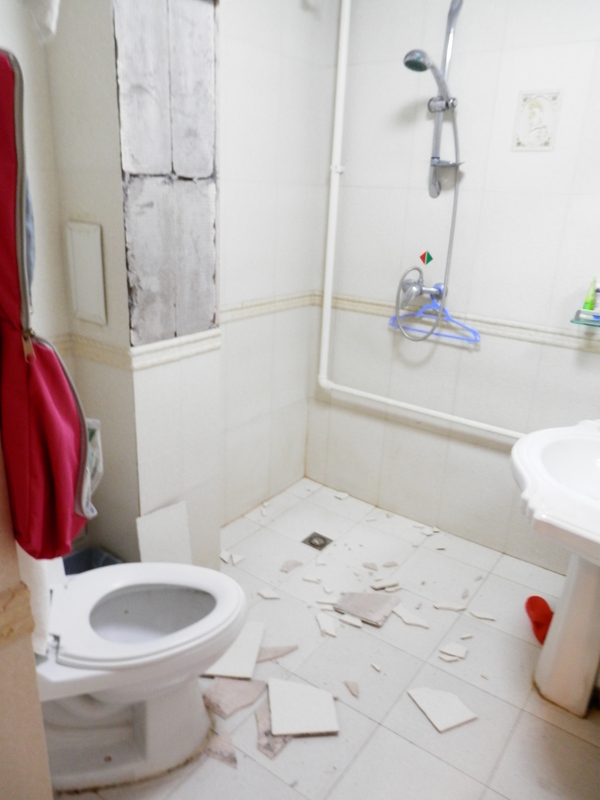 On walking into our bathroom, I discovered that half of the wall tiles were smashed on the floor, and the toilet blocked. Being practical (yes, she can be sometimes), Katy thought she would get on with some washing while I was out. On attaching our cordless washing line to the wall, she brought half the wall down with it. Luckily no fees were incurred, even though we snapped the room card in half as well. In our last days in Beijing we took a visit to the Great Wall and a day at the Summer Palace. The Great Wall was amazing, but quite hard work. We didn’t have the best day weather wise, but still had some great views. Katy almost died on the first stretch of our walk, before we were even on the wall, and it was definitely a test of our fitness. 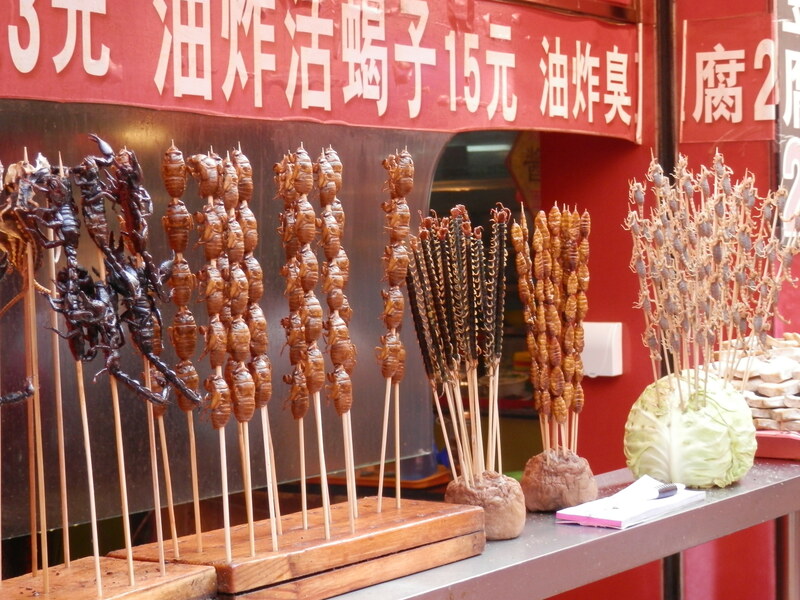 I also had the experience of eating a scorpion from a hutong street seller. Katy wasn’t brave enough to try one, but it was quite a funny experience. We’ve now arrived in Chengdu for 6 days, and we’re looking forward to chilling out for a bit. First impressions of the city are not at all what I imagined. I was picturing a small picturesque town with a village feel, with pandas roaming freely. Instead we were greeted with another sprawling industrial city with a love of neon. Our hostel here is great though, and we’re looking forward to part two of our adventure in China. We had planned to post this message much earlier than this, but we’ve had various problems with the Internet. Mainly that our blogging site is blocked, along with Facebook and Twitter. I’ve now overcome the problem with some geeky giggery pockery, and set up a VPN. So we’re all systems go. Well after what seemed like an eternity, we’ve finally done it and left for our travels. The journey over wasn’t without incident, but nothing worth getting stressed about. Or at least that’s what I told Katy. Just 12,000 km, a £17 round for a pint and a half of beer in Dubai, forgotton entry forms which meant we had to queue twice through immigration and a missed airport pick up. Still we made it in one piece and are still talking to each other. That’s even after a 3-0 win for Arsenal against Bolton on Saturday, which we watched in Paddy O’Shea’s Irish pub. Yes we are in China. I’m pleasantly surprised about how much I like Beijing; Katy isn’t so sure. The stories of how difficult it can be to get around are a bit over-hyped. Although we’ve already seen that it can be challenging speaking not Mandarin. Having to order food can be a bit of a lottery, but at least we may get to try food that we otherwise wouldn’t have. We met up with Shiona’s friend Nick, and he was kind enough to take us out for our first taste of Peking Duck. We were very spoilt in a lovely restaurant and a nice bar afterwards. I’m not sure how often we will manage to eat in restaurants like that on our budget, but I’m sure Katy will give it a good go.It was good to talk to someone who lived locally, and was another opportunity for Katy to get her map out. We’ve managed to get round some of the sites already. Tiananman Square and the Forbidden City was a never-ending walk of very similar buildings. Every China-man and his dog (literally) seemed to be in there on Sunday, and to be honest we were pleased to get out. We must have walked almost half way round Beijing in the first couple of days, but we’ve now learnt the wonders of the subway, which is probably the best and easiest I have ever used. We found out that next week is China’s national holiday, which meant that almost every single train in the land has been booked. We were planning on a train to Chengdu, but when we were told that we would have to have a standing ticket for a 32 hour journey, we decided to book a flight. We’re off to see the Great Wall tomorrow, for a nice 10k walk in the sun. We’ve been preparing tonight by eating possibly the nicest Chinese food we’ve ever had, and didn’t stop eating until we couldn’t move. I’m sure this beer will wash it down ok.